In Blade & Soul, the major role of Moonstone is to make S series weapons. There is an increasing demand on Moonstone due to the change in weapons upgrade materials, which makes the price rise. 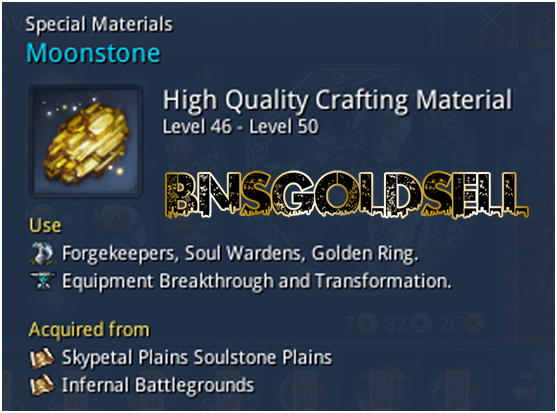 With the increasing demand on Moonstone, I write this guide to analysis where and how to get Moonstone in Blade & Soul. If you want to buy Blade and Soul gold, BNSGoldSell promise fast delivery and safe transaction. 1.Dragon raising valley. After the Dragon Raising Valley weekly or daily quest, you can gain Moonstone box reward. The dragon fruits can be used to exchange for Moonstone box that can bring Moonstone rewards. 2.To get Moonstone powder, you can go to the crafting workshop where 300 Moonstone powders can be turned into 100 Moonstones. You can turn 4 Moonstone powders into 1 Moonstone with the change button. 3.After you complete the Skypetal Plains quest, you can gain Moonstone powder as reward. 4.After the Beluga Lake daily or weekly quest, you can get Moonstone and weapon upgrade materials as rewards. Also, you can gain dragon fruits in the Beluga Lake. 5.There is a large amount of Moonstone martial output in Battle Island. Just try you best to run through it. 6.On the Skypetal Plains, camp rank merchant can choose to carry the aura of redemption Moonstone boxes which need 900 primary exchange essence Level 1 Moonstone Exchange box that requires 1800 essence. 7.You can gain Moonstone if you complete the Discipline field. Though it is not too much, don’t miss it. Besides, you can get Moonstone at poly spirit Pavilion or treasure trove.